Looking for the perfect gift but you can't decide? Choose for a Gift Cheque (Cadeau Check) en let the lucky receiver of the cheque decide for him / her self! If you need a Check value that is not available yet, please give us a call or email and we will be happy to add it to the list op value options. If you order a cheque we will send it by email so you can print it yourself. 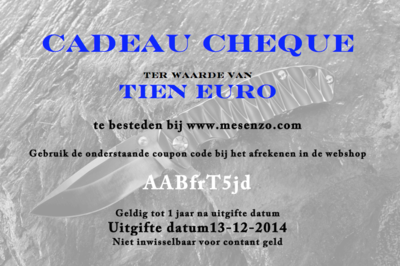 It is also possible to receive the Cheque (printed on Photo paper) by standard mail (on check out, choose under "extra options" for "recieve gift cheques by mail"
Use the coupon code from the Cheque at time of check out in the webshop to redeem it's value. U can use only one coupon code for each purchase. The Cheque is valid for a period of one year starting from the date of issue. The Cheque is not exchangeable for cash money.